Using an online legal service like Incorporate.com is a reliable way to form an LLC, and it’s much less expensive than hiring a lawyer. 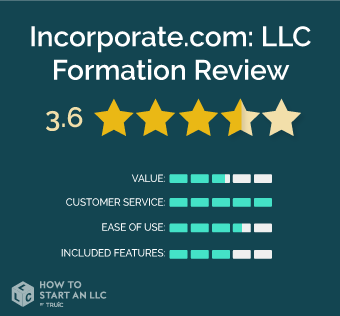 In this review, we’ll go over the details of Incorporate's LLC formation service and explain how it compares to other services on the market. Read on to find out if Incorporate.com is the right choice for you. Incorporate.com is among the top name brand services that can help you file your LLC online. As a division of the Company Services Company - which employs more than 2,000 workers and has been in business since 1899 - Incorporate.com can complete the LLC formation services all in-house. Incorporate.com does not subcontract your LLC paperwork through 3rd parties. This is a distinct advantage that offers a level of confidence that few competitors can match. Incorporate’s LLC formation packages offer robust features - along with equally robust pricing. Unlike most other services, Incorporate.com provides a $75,000 Corporate Veil Guarantee. This is to help in case a plaintiff sues to go after your assets. There are stipulations worth noting, though, that we cover in our comparison of pricing options. Who is Incorporate.com Right For? Incorporate.com has a lot to offer if you’re willing to pay a little more for a premium service. Find out if your business could use an extra layer of protection for your members’ personal assets. Our recommended alternative to Incorporate.com is Northwest. They provide great value and customer service, you can read our full review here. Incorporate offers three levels of service: The Starter, The Essentials, and The Works. In case we haven’t already gotten the point across, Incorporate.com’s services are expensive. Our biggest gripe, however, is that no matter which package you choose, Incorporate.com automatically enrolls you in their $235/year registered agent service. This service is more than twice the average cost of other popular registered agent services. You can contact customer support to opt out of the registered agent service, but Incorporate.com may delay your LLC formation and will no longer deliver all promised benefits, such as the $75,000 corporate veil guarantee. On the other hand, Incorporate.com gives you the flexibility to add or remove services from each service bundle, which puts you in control of costs. For example, you can get the Starter package and order the operating agreement on its own for less than the cost of upgrading to The Essentials tier. For this reason, we’ve included each tier’s benefits along with the price of individual features in bold. When we formed our test LLC for this review, this is the package we went with. If you want to qualify for the $75,000 Corporate Veil Guarantee, expect to pay another $235 for the Registered Agent service. We opted out of this service and were immediately notified this would delay our LLC formation by up to 6 weeks. To get all the bells and whistles offered at this tier, expect to pay upwards of $334 - not including the State filing fees. Incorporate.com's registered agent service starts when your company is formed by the state. Once they receive notice from the state that your company has been formed, they’ll charge your card or checking account $235. This fee will be charged each year until you cancel the service. Who should purchase The Starter? 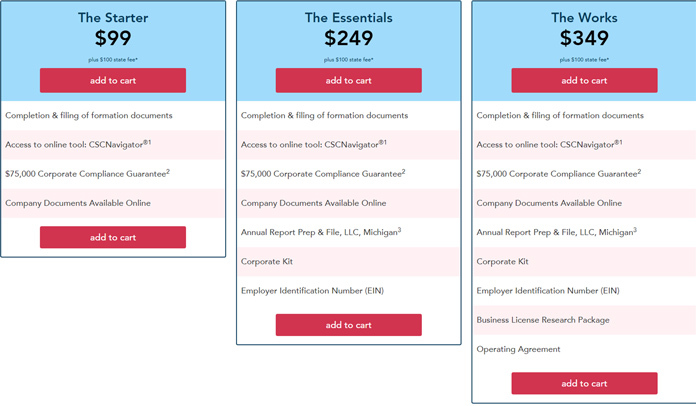 If your ideal budget to form your LLC is around $400, this package offers some valuable perks. The Compliance Watch service will help you stay on top of filing deadlines. If you’re looking to get your documents in hand fast, you’ll like the electronic delivery. Legal document that establishes the rules of governing a business owner’s - or group of owners’ - financial and managerial rights/duties. Who should purchase The Essentials? If you’re looking for a little extra support getting your LLC up and running as fast as possible, the Essentials should fit the bill. The included EIN registration and LLC operating agreement make it possible to begin operating your LLC from day one, and the Business License Compliance Package offers valuable assistance if you’re uncertain as to what sort of licenses your business may require. Who should purchase The Works? The Works package is for the entrepreneur that makes a habit of sparing no expense. If you’re used to concierge-style service, you’ll likely find the Business Coaching particularly appealing. Choose The Works to get the closest thing to putting your LLC filing duties on auto-pilot. Incorporate.com is among the more expensive LLC formation services you can find. The basic package includes features like the Compliance Watch and Corporate Veil Guarantee. These are useful services automatically bundled into their entry-level $99 Starter package. That means you’re likely going to spend closer to $300, and potentially more. This depends on the state of LLC formation. If your primary goal is to form an LLC, there are other services like IncFile that will do this for half the price. Customer service was knowledgeable and attentive. The agent we spoke with was friendly and didn’t seem to be in a hurry to get to the next customer. The chat representative was able to answer our questions without any additional hold time. We weren’t redirected to call in or upsold on more expensive services. No complaints. The Incorporate.com checkout process accomplishes in around seven pages what other services do in about 4. One of the checkout pages looked stuffed with upsell offers for extra services. In total, the buying process took between 8 - 10 minutes after factoring in the time to read each upsell offer description. You’ll be able to complete the task of filing your LLC, but Incorporate.com isn’t shy about letting you know what else you can buy along the way. Although the packages run at a premium cost, some features included are quite valuable. The $50,000 Corporate Veil Guarantee is a unique benefit among LLC formation services, and a lot of freedom to pick and choose some package features individually. A significant drawback though is the cost of their Registered agent service, which is available for $235 per year. The website is quick to notify you that your order may be delayed by up to 6 weeks if you opt out of using their Registered Agent service, which felt like a scare tactic designed to capitalize on less experienced business owners.